Last Friday night E and M went to the movies, and so the little one and I had some hang out time on our own. I asked her what she wanted to do and she said she wanted “extra” books, which I’m guessing meant more than the three bedtime books she gets each night. We don’t really have limits on book reading most of the time, but at bedtime we have to draw the line somewhere. I’m all for a good read most anytime. I’m not all for stalling during the witching hour, and I’ve given birth to two champions in bedtime stalling tactics. “Sounds good to me,” I told her, and she started pulling titles off the shelves and stacking them on the couch. 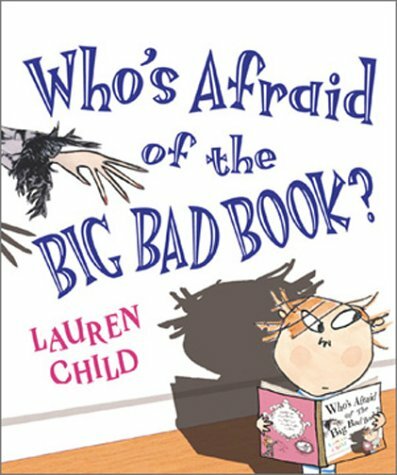 One of them was my favorite Lauren Child book – Who’s Afraid of the Big Bad Book. And calling this my favorite one is saying something, because I really do like all the Charlie and Lola books by Child. But this one is just so much fun to read aloud. “Herb loves storybooks,” is how it begins, and you read this definitive statement knowing there is a big “but” to follow. Because there is… Herb does not respect his books. He’s messy and sloppy and he sticks stickers into them and occasionally doodles things (like moustaches) in them, and occasionally (Gasp!) he cuts.things.out.of.them. This is like a dagger to my heart. I love reading books, but I really love the books themselves. I like sturdy hardcover books with book jackets that are in good shape. I never fold down corners. My girls are just the same – apple / tree. So whenever we read that first page and watch Herb leave milk glass rings on the page and see the occasional squashed pea carelessly dropped from his chin and then sandwiched between the pages we are aghast. We are mortified. We are shocked. And then we cannot stop reading. Poor Herb falls asleep in one of his mistreated novels and finds himself inside the book and at the mercy of some royally ticked off characters who have suffered at the hands of his sloppiness and are ready to exact some revenge. He struggles through page after page of the fairy tales, running from one irate person to another. The evidence of his tampering is everywhere. F’s mouth forms an “O” when Herb admits to cutting out Prince Charming for a birthday card he was making for his mother. He eventually learns his lesson and sets out to make things right. Nothing good ever comes from mistreating books. It’s a better moral than the original ones ever were. I think this book is perfect for the 5-10 set, but even my three year old loves it, even if she doesn’t completely get all the fairy tale references. She can still be mildly horrified by the bad book treatment, and there’s nothing quite as satisfying for a somewhat mischievous preschooler than finding herself in the position to judge others bad behavior. I’ve always enjoyed new takes on old stories, particularly fairy tales. 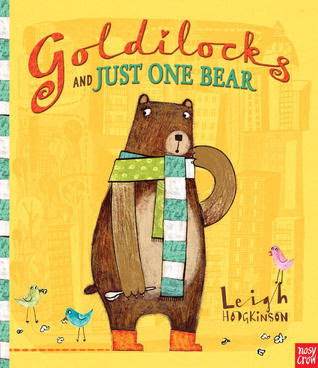 Another good one we’ve checked out recently is Goldilocks and Just One Bear by Leigh Hodgkinson. This book is in the same vein as Who’s Afraid of the Big Bad Book in both the illustration style and the way the story and the characters read. In this story a directionally challenged bear gets lost during his morning walk and finds himself smack dab in the middle of the city. Being lost makes a bear tired and hungry and he stumbles into a posh condo and makes himself at home – you know, trying out various foods and chairs and beds before finding ones that are “just right”. The unsuspecting family comes home and finds things are not as they left them. Then there is a moment when the (very blond) mother and the (very large) bear get this strange sense of deja vu. You guessed it – the tables have turned, and there’s an instant reunion and a bit of reminiscing about the old days. This book is great for any kid that knows the original story, and loves the concept of an out-of-place character trying to make themselves at home in a stranger’s digs. Older kids will love the funny references and modern takes on the classic fairy tale, and little ones will enjoy tracing their fingers over the crazy mixed up path this poor bear takes. Both books are large, beautifully illustrated books and would make great gifts for any fairy tale lover. Thanks to a very generous gift certificate from M’s parents, I had some Fabric Nosherie money burning a hole in my pocket. So I plugged said hole with some summer projects. 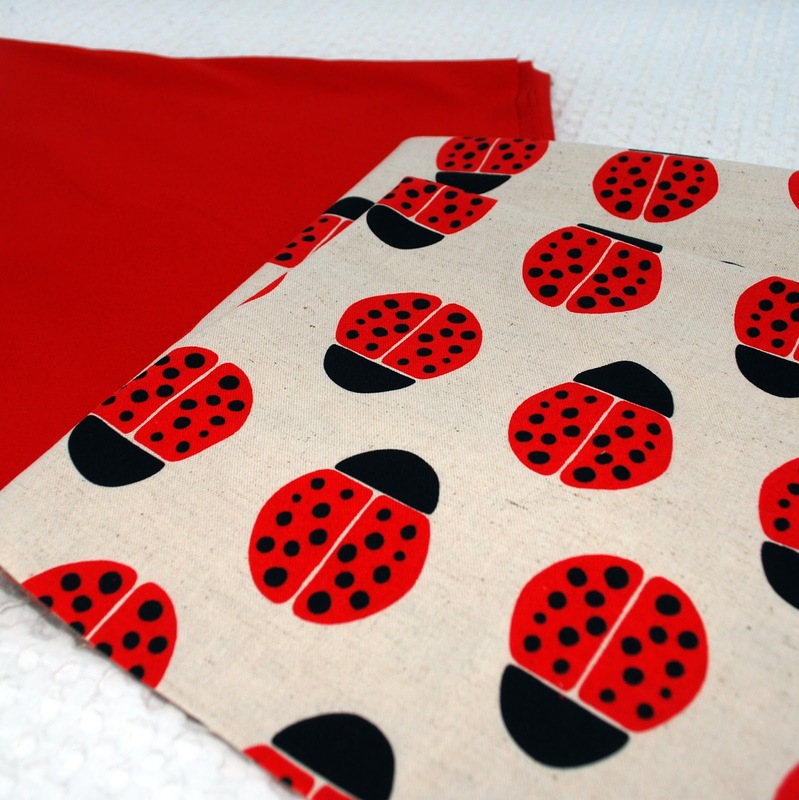 The ladybug fabric is for a lined bag that E and I are going to make for our favorite Ladybug Girl’s birthday. The fabric below is to make another drawstring play mat for the girls like the one I made with Brooke in a class last December for my nephew. 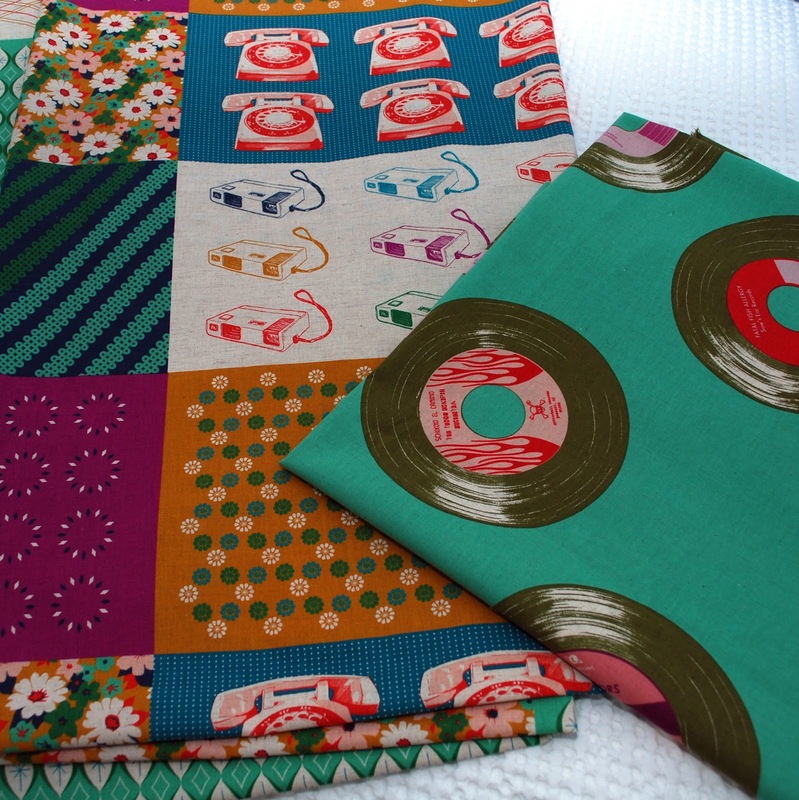 And I love, love love this fabric combo. When I made F’s pouf last year I inadvertently made double the amount of batting wedges because I didn’t realize that the batting I purchased was two layers thick. 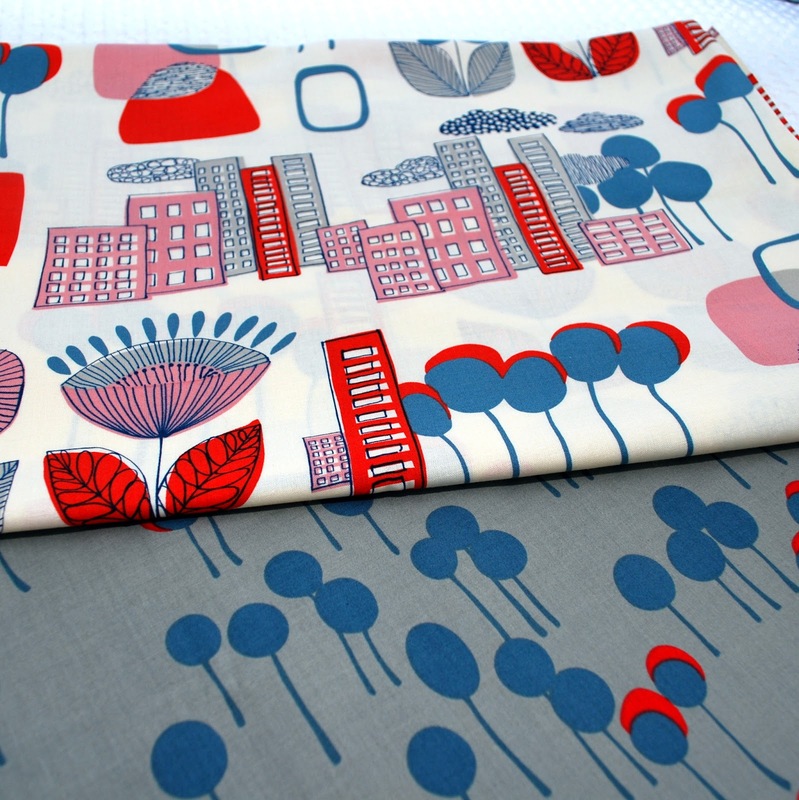 So I have half the materials I already need to make another one, and this fabric is perfect for E’s room. She’ll love it. Speaking of summer projects, I need to check in on my way overdue curtain fabric order. Looks like I’m going to be busy. 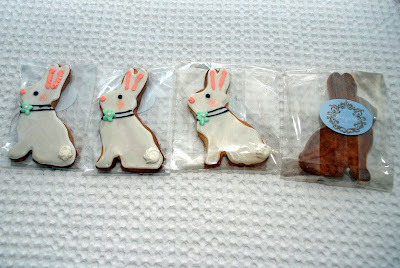 I usually make the Easter cookies like these, but that was a lot easier to do when I didn’t work on Fridays. The weeks fill up fast now, and the weekends even faster. Luckily we have no shortage of good local shops to fill in the gaps of homemade goodness. I thought I’d post a few photos in case you in town and still looking for basket fillers. F and I stopped in two places after work today, and I’d like to say a big thank you to all those businesses that stay open past five. Hurray for that. First we stopped into La Patisserie Chouquette to check out the new digs. It is just as gorgeous as everyone says – and I’m hoping to stop in many more times. It’s just a little too beautiful, perhaps, for a three year old. The whole time we were there I was afraid she would accidentally knock into one of the displays and send one of the amazing cakes onto the floor. It’s like walking into a jewelry store, everything seems precious and untouchable. Or to me, even better than a jewelry store. I can take or leave the bling, but I’m all about gorgeous pastries. I was pleasantly surprised at the non-precious prices. I thought they were very reasonable – at least the items I focused on. These cookies were $3 each – and take it from a cookie maker – it’s really hard to make something like this and have $3 cover the ingredients and the time. These would look so sweet in a basket – they have bigger ones as well, plus carrots. Very, very cute. I would also recommend the jelly beans. F and I split a box as a treat, and they might be the best jelly beans I’ve ever had. 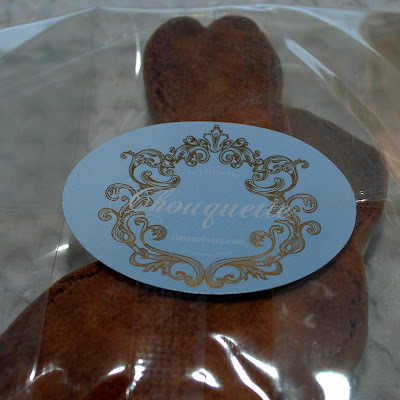 It’s slightly dangerous that we pass two amazing sweet shoppes just on our drive home – especially when you consider our entire commute is just a couple of miles. 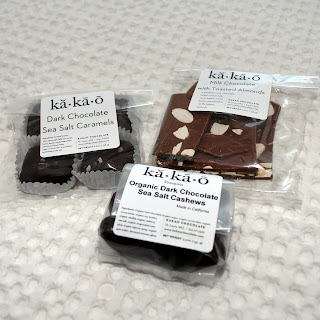 Kakao always delivers, and we picked up some sweet treats for the grownups. It was especially fun to find these lip balms – I got four for the girls and their cousins. They are handmade by Maven, a neighbor to Kakao’s Maplewood location, using Kakao chocolates and pates de fruits. F is going to flip. 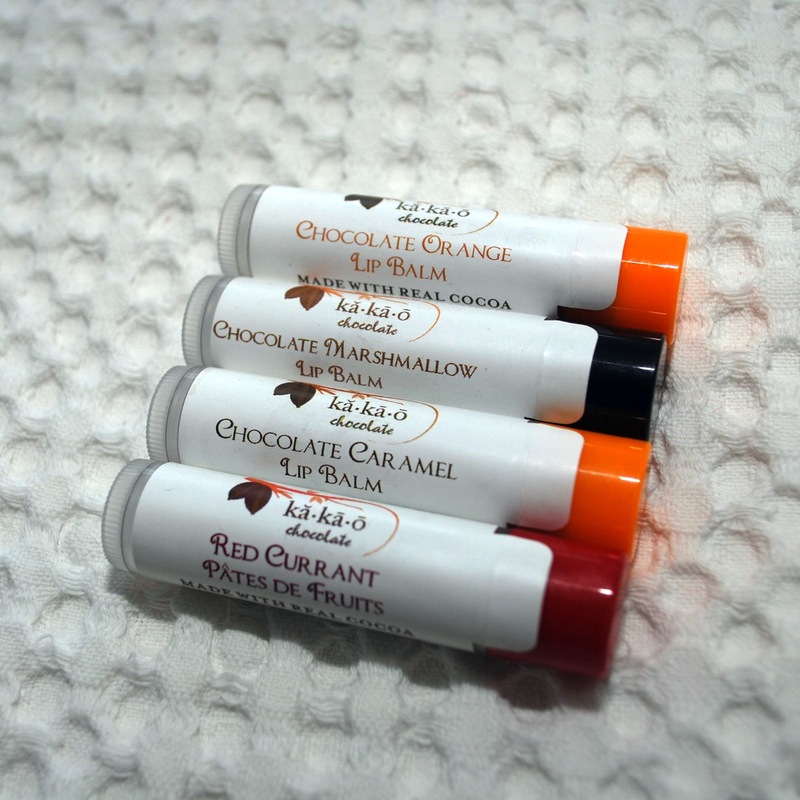 She’s absolutely obsessed with chapstick. So maybe this holiday skip the giant bags of pastel wrapped Hershey’s and pick up a few of these sweet little handmade treats. Or forget the holiday, and just celebrate the drive home from work. Works for me.